is woody and full of a substance called tannin. Tannin is a preservative with a bitter flavour. is covered in a whitish bloom which is a dusting of wild yeasts and bacteria. The skin itself contains more tannin and, in black grapes, a colouring pigment. contain bitter oils and are never desirable in white wine making. is the most interesting part of the grape in white wine making. Over 70% of the pulp is just water, but the remaining 30% contains most of the elements which give a wine character, flavour and interest. These elements include various fruit sugars and acids, trace elements absorbed from the earth and pectin, a gelling agent. The pulp of almost all grapes is the same colour: a pale green/yellow. Since the juice of almost all grapes is the same pale, almost clear colour, white wines can be made from any colour of grapes. If using black grapes to make a white wine, the winemaker must separate the juice from the skins immediately after pressing and before the fermentation stage, so that no colour is picked up from the skins. Some examples of white wine made from black grapes are Champagne, blanc de noirs and white zinfandel. Most whites are actually made from green grapes. There is, therefore, no hurry to separate juice from skins since there is no danger of them picking up colour, but most winemakers prefer to separate anyway, to prevent tannin leaching from the skins into the juice. Though there is an insignificant group of black grapes whose flesh and juice is actually dark, almost all red wines extract their colour only from the skins of black grapes. Red wines therefore, can only be made from black (or red) grapes. Harvested grapes are taken to the press as quickly as possible to avoid oxidisation of the grapes as they sit exposed to the air. At the winery, white wine grapes usually go through a machine called a crusher-destalker. This machine breaks the skins of the grapes but doesn’t press them. It removes the stalks and most of the pips, and the mash of broken grapes is immediately poured into a press. A gentle pressing is required for white wines. There have been many improvements on the original heavy stone presses, the most common now being the pneumatic press, where a bag is inflated inside a tank, so that grapes are squeezed against the sides. Pure juice is collected from this process and poured directly into the fermentation tank. Recently, some winemakers have returned to ancient traditions of including the skins for the fermentation of white wines, in which case the pressing step comes after fermentation, just like a red wine. After fermentation most white wines are run into stainless-steel tanks for a period of settling. A few months later they are filtered and bottled. Some wines will undergo a further period of maturation in oak casks before bottling. Temperature is the bugbear of white wine makers. Hot countries struggled to make quality white wines because these require long, cool fermentation (at around 15°C). The act of fermentation itself creates heat, and in a hot climate with uncontrolled tanks, the result is a very violent fermentation with temperatures rising to 35° or more and yeasts dying off quickly. Perhaps the greatest innovation in the history of white wine making has been the introduction of temperature controlled stainless steel tanks for fermentation. Introduced first in Australia and California, these huge, refrigerated tanks have taken the winemaking world by storm. Even in the hottest climates, white wines of distinction can now be produced. Countries like Spain, Greece and southern Italy can, for the first time, produce whites of world class quality. This use of new technology has also led to a new breed of expert, known as the “flying winemaker”. Largely from Australia and California, these winemakers travel the world to advise old-fashioned wineries on new technology (like stainless steel) that can bring them up to date. Some white wines are fermented in old wooden vats. These will also have some method of cooling applied, such as being surrounded by a coil of pipes through which cold water is pumped. These vats are less reliable than steel, but some winemakers swear that fermenting in oak is the only method to use. Many of the greatest white wines, including white Burgundy and sweet Sauternes, are fermented in small oak barrels with stunning results. This labour intensive technique is usually reserved for the highest quality wines, especially those built for long ageing. Once fermentation is complete (taking between 1 and 4 weeks or so) most white wines are considered complete. The wine is simply run off into clean steel containers to settle before bottling. 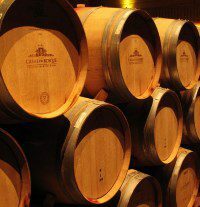 The alternative is to mature the wine in small oak casks (often referred to as “barriques” – the Bordeaux name). Maturation in oak is much more common in red wines, but chardonnay and semillon in particular seem to marry very well with the unique vanilla/buttery flavour that oak imparts to wine. Maturing wine in barrels is an expensive and labour intensive process, as we will see next week when we look more closely at the process in relation to red wines. Often, the taste we notice most in a chardonnay has come from the oak, not from the grapes. In the cheapest chardonnays, handfuls of oak chips are added to the wine to impart a commercially desirable oaky flavour. Whilst tasty, these wines are rarely subtle or sufficiently well-balanced for ageing and further development in bottle. Finally, prior to bottling, the wine must be filtered to leave it crystal clear. This process can be carried out by many methods. Use of filters and centrifuges to eliminate all solid matter are effective, but some people claim these methods also remove body and character from the wine. A more traditional method is fining. Fining uses a gelatinous substance that is stirred into a barrel of wine. The fining agent gradually sinks to the bottom of the barrel, dragging all particles with it. Traditionally, fining is done with whisked egg whites. Other common substances are bentonite (a clay) and isinglass (made from fish bladders!). Once the wine is perfectly clear and bright it can be bottled, labelled and shipped. Wines might also undergo a process of “cold stabilisation” before filtering, when they are chilled in order to force tartaric acids naturally present in the wine to form into tiny crystals. These crystals can then be removed during filtration. This is done mostly for cosmetic reasons: white wines that are not stabilised might throw these crystals naturally during storage or transportation. When the consumer sees tiny white crystals in the bottom of a bottle it can be very off-putting, though in fact they are harmless and tasteless. at oak and barrels in relation to red wine. The winemaker can also decide how much residual sugar to leave behind in the wine. If fermentation is stopped early, before the yeasts eat all the sugars, then a certain amount of sugar is left behind. For very ripe wines from hot climates it is perfectly possible to produce a wine that has 13 or 14 degrees of alcohol yet still has some residual sugar. In some countries the addition of extra sugar is allowed during the fermentation stage – a process known as chaptalisation – but this is done to boost alcohol to a minimum standard, not to sweeten the finished wine. Malolactic fermentation is a natural biological process that occurs after alcoholic fermentation if the wine is kept at a slightly increased temperature. This is a chemical change, whereby harsh malic acid (such as that found in tart green apples) is converted into lactic acid (found in milk). This has the effect of softening the wine and reducing obvious acidity, so the winemaker may choose to encourage or avoid malolactic fermentation according to his requirement for a specific style of wine. This is achieved by inoculating the wine with relevant bacteria. Maturing the wine ‘on the lees’ – keeping the skins and dead yeast cells in contact in the barrel – can add a creaminess and complexity to a wine. Again, this is done at the winemaker’s discretion and is a process that requires care and attention: the ‘soup’ of wine and lees can spoil if scrupulous hygiene is not practised. – ginger, cinnamon, lychees, nivea cream! Steely – crisp and a bit austere, like the best Chablis or Sancerre. Using this jargon for describing and talking about the characteristics of wine isn’t compulsory – if you are more comfortable with simply describing the glass in your hand as “good”, “ok” or “bad”, then that is quite acceptable!